Tag the fish in the proper area: in the dorsal muscle behind the head and gill plates, above the lateral line, and away from vital organs. Place the applicator against the fish and insert the tag until the dart is anchored. Avoid placing the tag too deeply into the muscle. Do not jab the fish! Speed-tagging can result in injury or mortality. For billfish, please do not remove them from the water as boating them increases their mortality significantly. Studies have proven that even when they appear to swim away fine, they die within two or three days after release. The fish should be released by removing the hook or cutting the leader as close to the hook as possible. Never pull, jerk, or rip a hook out of a fish as this will cause significant injuries to the fish. Minimize handling. Handle fish gently, but firmly to prevent them from excessive “flopping” around, as this can cause injuries. Never handle a fish by its eyes or gills. When handling smaller fish, use a wet cotton towel or gloves to minimize the loss of protective slime. Large fish are best released by leaving them in the water and removing the hook. If you bring a large fish on board, never use a gaff. It is preferred that an exhausted or stressed fish be revived by towing it slowly forward through the water before release. Visit https://grayfishtagresearch.org/register-your-fish/ to register your catch and add photos of your catch that will appear on the website. It is very important to record information completely (date, species, location, fish size, weight, and condition) and submit cards soon after the proper tag and release of your fish. THE FISH ALREADY HAS A TAG? Congratulations! You will soon fight out how long your fish was at large, how far your fish traveled, and how much it grew during that time period. Leave the tag in the fish and record the tag number immediately. The value of a tagged fish is greatly enhanced if it can be released and recaptured again, providing a road map of its movements over a period. Remove the tag by cutting it off at the base rather than try to rip the tag out, which can cause injury to the fish. Visit https://grayfishtagresearch.org/register-fish-tag-recovery/ to add your recovery and photos of your catch that will appear on the website. The most important information is the tag number as this is the key to identifying the fish. Please also record the total and fork length of the fish. If you do not have a measuring device, you can estimate the length and weight of the fish. Record the species, the location of the catch, and you may record any other important information you think may be important. Lastly, please submit photos along with your recovery information. If all information is submitted properly, you will receive a reward from GFR. 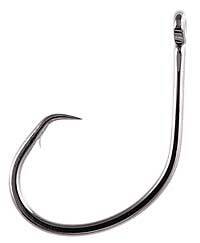 Use non-offset circle hooks whenever possible when using live or dead baits.